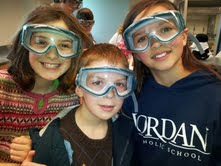 After a kids chemistry day at a local college; home chemistry became all the rage for a day or two. Here: writing with radishes on baking soda-painted index cards. The First May Pole of the week; and of our lives, thank you for sharing this with us! The second May Pole and Beltane celebration of the week...and of our lives! More pics from Sunday's May Pole dance; thank you, we had such a good time! Visiting the French Consulate in Chicago to vote; great reception area! The most fun in stand-behind bodies I've seen yet. Thanks for the photos. Looks like it was a lot of fun.